Alan shares his observations and learnings from working as a Mediator and Conflict Coach with regard to the ways that people become stuck in unresolved conflict but also how they go on to create more effective ways forward in their difficult situations. understand. 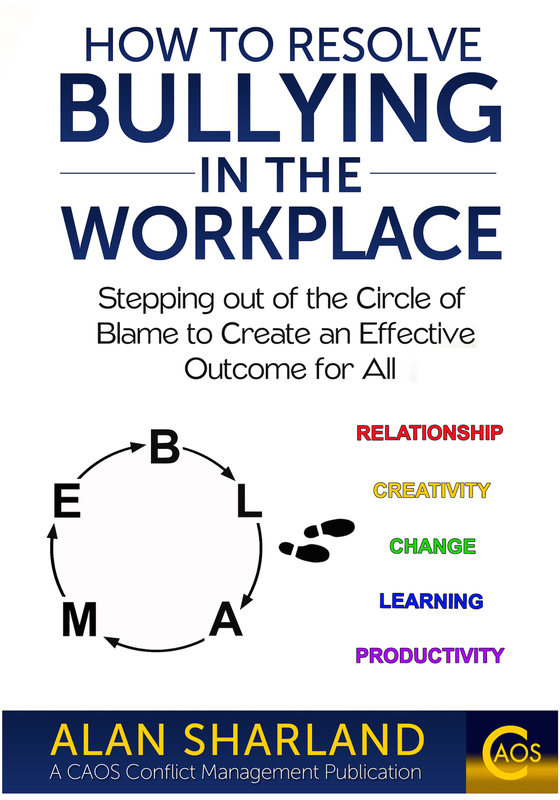 A brilliant book and I will recommend it to everyone." This page looks at the use of a simple reflective learning process used in training and in particular, experiential learning approaches to training in mediation, communication skills and conflict management skills. The process can be used in various other training environments but it is particularly relevant to approaches which are participatory and interactive, that is, involving pair work, group work, role play etc. drawing upon the experiences of those present as the source of learning. 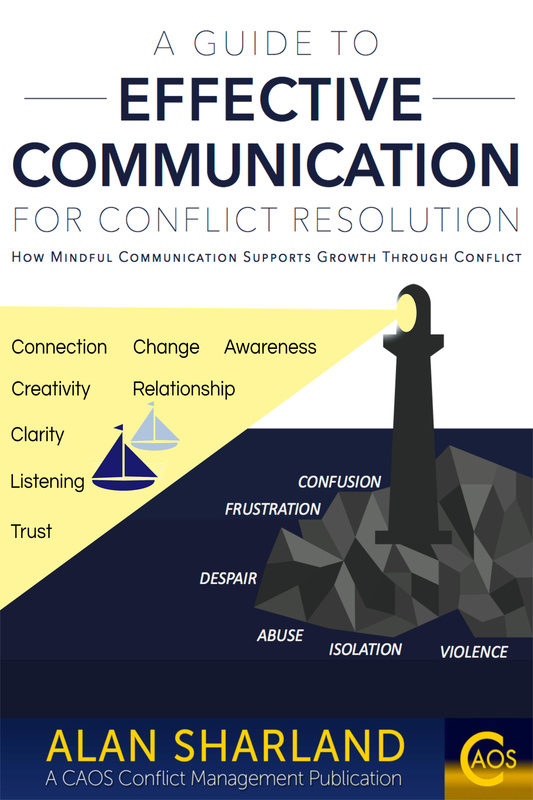 The process is very simple but I am describing it here with reference to the Principles of Effective Communication and Underlying Philosophies of Mediation and conflict resolution, to highlight how it is highly relevant to, and in keeping with these. This article was originally written for Newsletter 3. To see samples of previous newsletters click here. In this way I hope it will further enhance the credentials of reflective learning as a means of maximising the effectiveness of training via an experiential approach. The process used on our Mediation Training Courses at CAOS Conflict Management, and in various other areas in which I have provided training could be described as 'Peer Supported Reflection'. It is used both within the training activities provided, particularly role plays, and also at the end of each day to review the day's learning, in pairs or in 3's. What, if any, learning points did you gain? Of course this is a process that any individual can then use by themselves to review their practice, whether they have someone to ask them the questions or not. However, within the almost banal simplicity of this process is something which is highly relevant to the effectiveness of both experiential learning and to the effectiveness of the communication between the participant and the facilitator of the process (whether a peer or, in particular, a trainer). And on a course in communication skills, conflict management skills or mediation skills this is of crucial importance if it is not to be contradictory to the Principles of Effective Communication that it is promoting. It 'walks the talk' and 'practices what it preaches'. But at the same time it can be challenging to preconceptions about 'what training is' and 'what a trainer does'. The basis of this approach is that a trainer is actually a 'facilitator of learning' rather than someone who predominantly 'inputs' information and knowledge to participants. So, how does reflective learning via Peer Supported Reflection do all this? Often this process can be missing from many training environments and yet it serves a 'summarising' effect, allowing for a clarification of what has been experienced as a result of talking about it. This allows for a refining of what has been learned from the experience and this then contributes to the next question. What learning points did I gain from this activity? But all aspects of this simple process also fit with the Principles of Effective Communication and the Underlying Philosophies of Mediation. The participant is speaking for themselves and taking ownership of their experience and their responses. Sometimes in training situations, the participant is given 'feedback' before they are given an opportunity to reflect on their activity. In this way their opportunity to speak for themselves is lost and they have not been allowed ownership of their learning. Learning has been 'given' to them by another person, the trainer. The opportunity to identify for themselves the areas in which they have done well or could have done things differently has been lost. And they do not have ownership of their learning but instead have 'received' it from another. This approach reduces the likelihood of the participant being able to develop their practice as a mediator or other conflict management practitioner when they are out of the training environment as they have not been given the opportunity, nor the encouragement to practice reflective learning. In the field of mediation training this leads to many practitioners seeing the only 'answers' to their difficulties as being within another person, usually their trainer, or often their manager if they work for a mediation service. They have not learned principles of practice that inform their ongoing development, which they can then use for themselves as benchmarks for continuously reviewing their practice. This is common in many forms of training but I consider it to be particularly sad, and inappropriate, within the field of mediation training as mediation is a process through which we encourage and support others to be able to be self directed, to be empowered, to be able to see that reliance on another for things to be different is a route to stagnation. Our training needs to 'walk the talk' and 'practice what it preaches' in the very means through which it is given. It should not create a dependency for guidance or for assessment on those who trained us or who manage an organisation we work for. We need, as mediators to be able to self assess, and to be supported in that self-assessment and development by our peers, through an ethos of reflective learning being encouraged. If we do not self assess, and worse, do not believe it to be necessary, our development is at risk of stagnating. When this ethos is not intrinsic to our approach, our clients will also lose the benefit of this approach. Our inclination will be more towards a directive rather than empowering approach as this will be the approach we will have been trained in. This very simple process for promoting reflective learning provides an effective structure for self assessment, and a way of practicing this ethos within any experiential approach to training. Are you UK-based and looking for mediation, conflict coaching or training in communication and/or conflict resolution related issues? 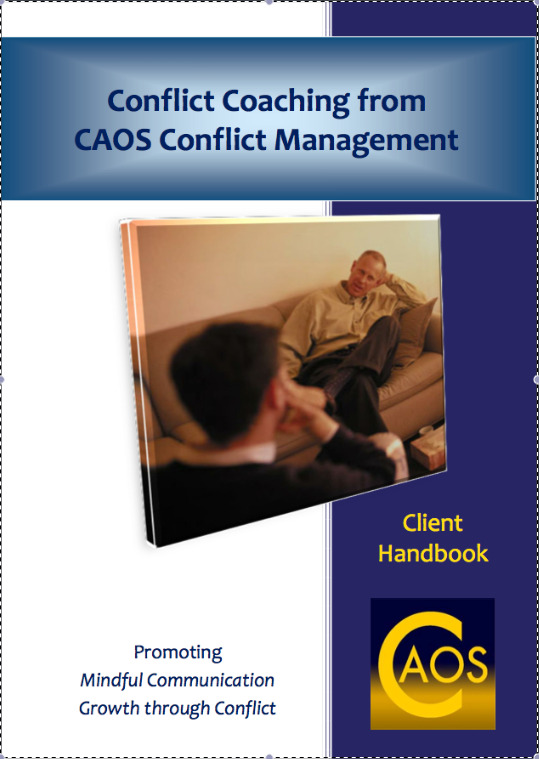 If you like the approach described on this site that supports the resolution of conflict and promotes effective, mindful communication, you may want to visit Alan's organisation website at CAOS Conflict Management. Click on the image link below to visit his site. A new page opens. Buy Now for just £4! or click on the image to find out more.